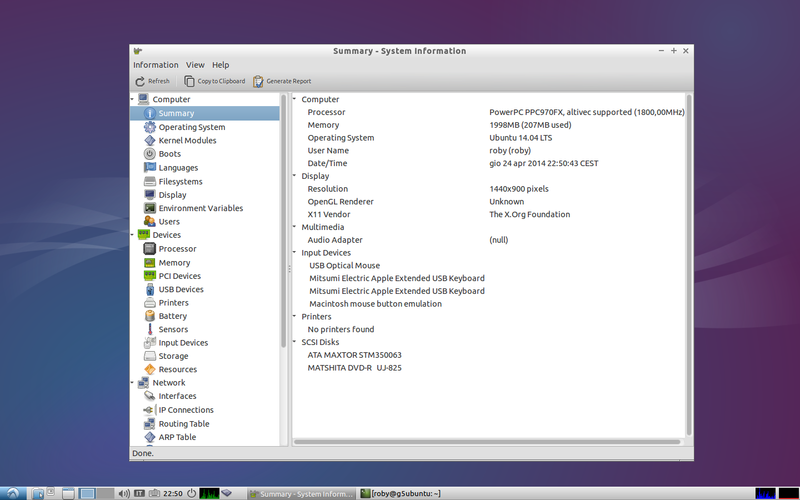 Lubuntu 14.04 desktop installation on my G5 with NVIDIA GPU freeze, even with G5 Qemu 2.0rc0 kvm lubuntu 14.04 live doesn’t install, it need an updated kernel i believe as on G4. 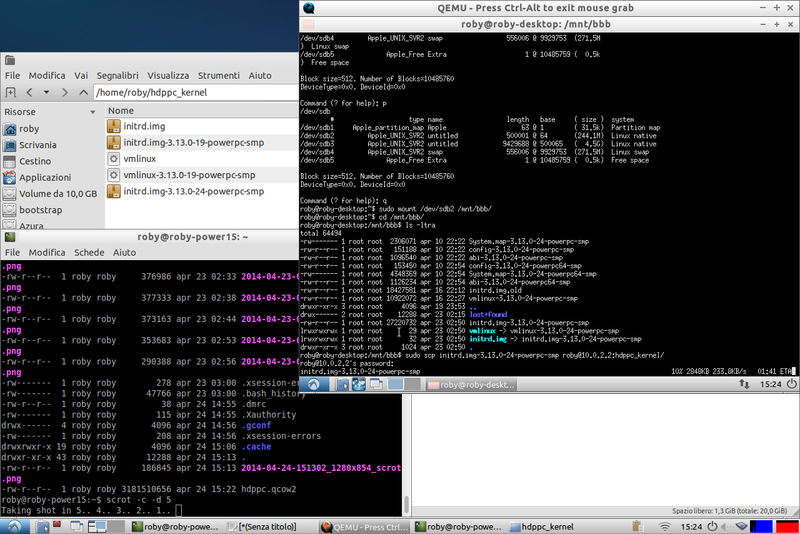 The lubuntu 14.04 desktop installation I have tested the installation virtualized on my G4 host with Lubuntu 13.10. In the previous desktop daily iso of Lubuntu 14.04 powerpc the installation stop ad the beginning of preparing partition, was working the lubuntu 14.04 alternate beta 2 install good virtualizaed, remain the old problem of creation newworld partition that it obligate you to associate a mount point ( the trick is first create an ext4 partition without mount point and then change the filesystem type to newworld. Installing on virtual machine with powerpc remain the problem that it doesn’t install boot loader ( with alternate and desktop iso), so finished the installation you need to start qemu specifying the vmlinux and initrd loading external from the disk image. This time I’m gone deep trying to install libguestfs on powerpc , needed to extract vmlinux and initrd from image disk file where we have installed lubuntu 14.04 powerpc. I was able to compile libguestfs 1.2.26 and supermin 5.1.7 for powerpc, but supermin appliance was not able to successfully create Supermin appliance on my 32bit lubutu 13.10. The supermin appliace is needed for guesfish or kpartx to extract files from partitions in image disk files. 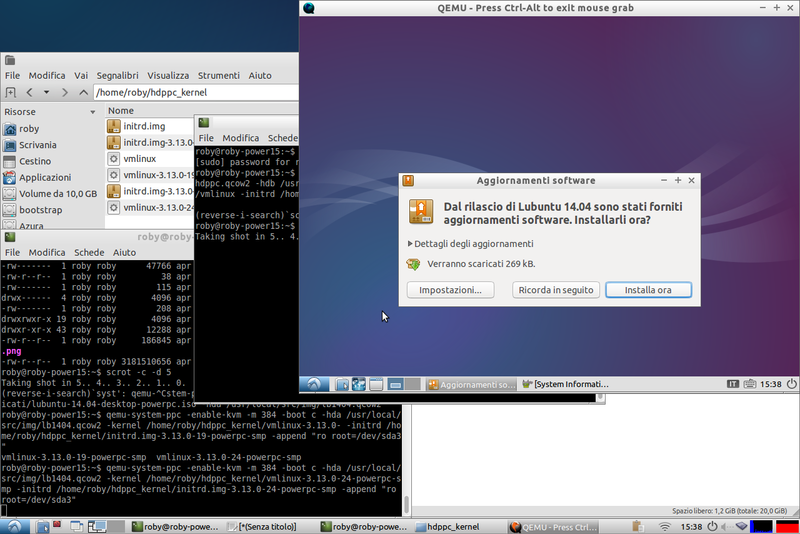 I have used another solution than guestfish to extract vmlinux and initrd, I have used an already installed virtualized lubuntu 13.04 powerpc with attached as second disc the new lununtu 14.04 powerpc image file. So from the lubuntu 13.04 powerpc virtualized I have mount the partition of second virtualized drive and I have made an scp of vmlinux and initrd to 10.0.2.2 that is the address of my host from the guest. 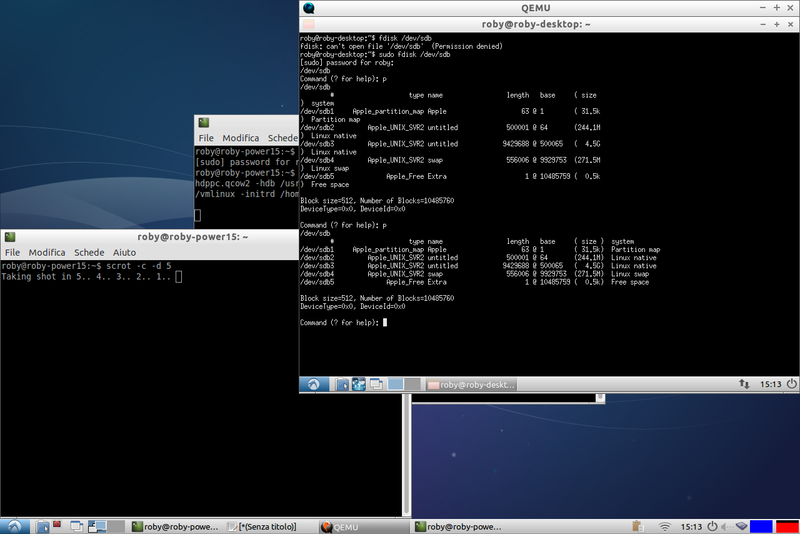 qemu-system-ppc -enable-kvm -m 384 -boot c -hda /home/roby/hdppc_new.qcow2 -kernel /home/roby/hdppc_kernel/vmlinux-3.13.0-19-powerpc-smp -initrd /home/roby/hdppc_kernel/initrd.img-3.13.0-19-powerpc-smp -append "ro root=/dev/sda3"
Lubuntu 14.04 install live or alternate virtualized on my lubuntu 13.10 powerpc ( on Qemu 2.0rc2) with my kernel 3.11 , compiled with kvm, was not working. 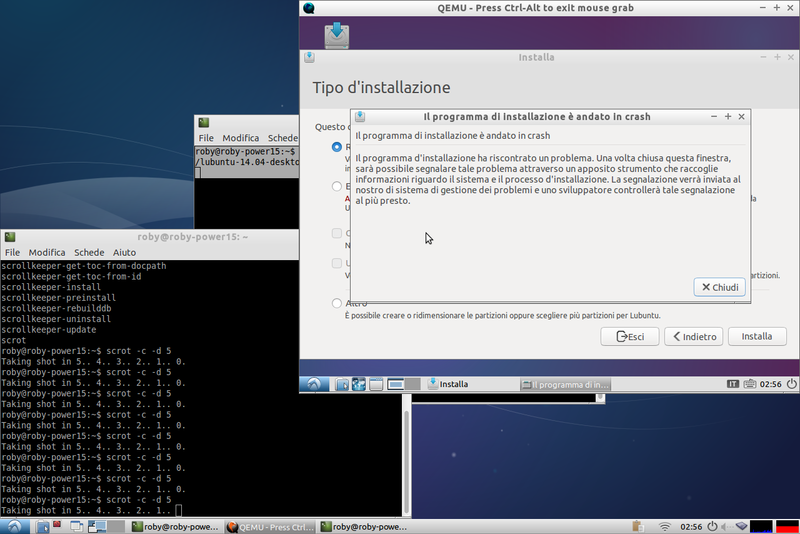 The lubuntu 13.04 installation was working perfectly. 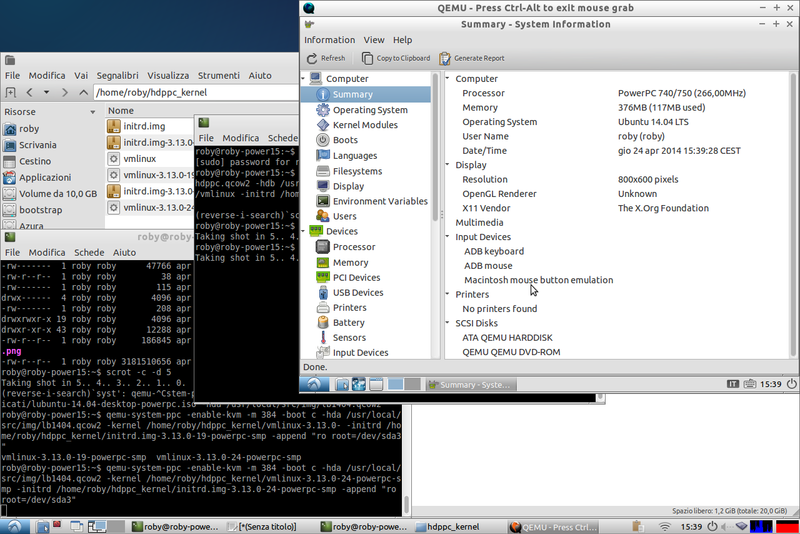 So I had updated to the kernel 3.13.9 petched thanks to Alex Graph patch , because kvm from kernel 3.13.9 on 32 bit powerpc like G4 contains a bug tha running qemu with -enable-kvm it tell me wrong parameter. 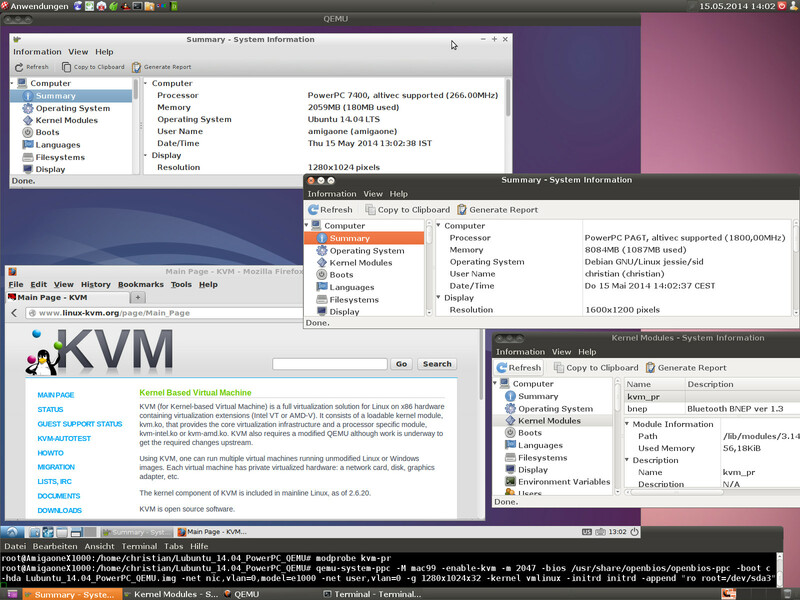 After applied the patch and recompiled only the kvm module qemu 2.0 work perfectly and with this kernel version start work lubuntu 14.04 qemu image file. 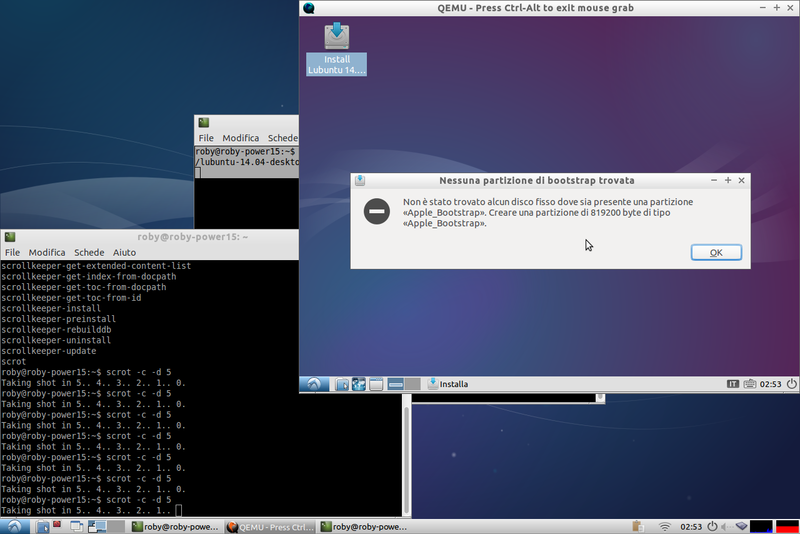 Lubuntu 14.04 desktop now work the installation , that until the daily build on 11th April was not working. Lubutu 14.04 desktop installation on my G5 with Nvidia GPU, anyway I have upgrated successfully from lubuntu 13.10, and nouveau is more stable on lubuntu 14.04 than lubuntu 13.10 so Lubuntu 14.04 powerpc look like improved!